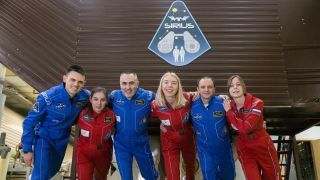 Six members of the international SIRIUS crew started the 120-day experiment at Moscow's Institute of Biomedical Problems (IBMP) on Tuesday (March 19). The SIRIUS-19 experiment is being conducted under the command of 44-year-old Russian cosmonaut Evgeny Tarelkin, who has carried out one space mission. Tarelkin's crewmates are fellow Russians Daria Zhidova, Anastasia Stepanova and Stephania Fedeye and Americans Reinhold Povilaitis and Allen Mirkadyrov. Povilaitis is an analyst of research and operations on NASA's Lunar Reconnaissance Orbiter (LRO) mission. Mirkadyrov works in the Telecommunication Networks and Technologies Branch at NASA's Goddard Space Flight Center in Greenbelt, Maryland. Christian Rogon is SIRIUS project manager at the German Aerospace Center (Deutsches Zentrum für Luft- und Raumfahrt; DLR) Space Administration. DLR is participating in the SIRIUS-19 isolation study together with the French space agency (CNES), under the leadership of the Russian space agency Roscosmos and NASA. This model outlines the space habitat simulator for mock moon and Mars missions at the Institute of Biomedical Problems of the Russian Academy of Sciences. The SIRIUS-19 crew will spend 122 days inside the simulator, which has 550 cubic meters of living space. The setup for the SIRIUS-19 experiment at the Institute of Biomedical Problems in Moscow. In addition to the numerous experiments and the many everyday challenges, one very special highlight awaits the SIRIUS-19 crew — a simulated visit to the moon. “Exactly halfway through the SIRIUS isolation study, four 'cosmonauts' will land on the lunar surface in a small capsule," DLR's Rogon explained. "Once there, they will carry out several 'moonwalks' while wearing spacesuits, collect samples and prepare a 'settlement' on the moon — a very special experience." Two "cosmonauts" will stay behind in the orbital lunar station and monitor the excursion. After the return and successful docking of the lander with the station, the whole crew will orbit the moon together for another 30 days. During this time, they will remotely control rovers on the lunar surface, dock more spaceships with the orbital station, and carry out numerous experiments before "returning to Moscow," a DLR statement on SIRIUS-19 noted. NASA and the IBMP have a long and successful history of collaborating on joint research related to human health and wellbeing in space. NASA's Human Research Program and IBMP are conducting research to identify preventive measures and technologies to protect the health of astronauts and astronauts during spaceflight.